Most likely starting with Celtic traditions, Mistletoe has long been a symbol of love, vivacity, and hope. It is believed that because this plant can grow in the most frigid of temperatures it became a symbol of divinity and tenacity. In Greece Mistletoe was used to treat many ailments. It was used to deal with menstrual cramps, epilepsy, ulcers, disorders of the spleen and ironically it was used to treat poisonings**. 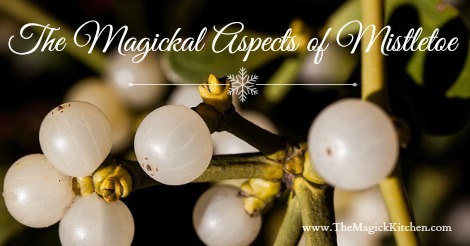 Over the centuries Mistletoe has become an common holiday tradition honored by Pagans and Christians alike. While there are many versions; in from Norse mythology, when Odin’s son Baldur was prophesied to die, his mother Frigg, the goddess of love, went to all the animals and plants of the natural world to secure an oath that they would not harm him. However, Frigg forgot to speak with the mistletoe. Loki made an arrow from the plant and used it to kill the otherwise invincible Baldur. According to other myths, the Gods were able to resurrect Baldur from the dead. Delighted, Frigg then declared mistletoe a symbol of love and vowed to plant a kiss on all those who passed beneath it. Since it is rare to find Mistletoe growing around oak trees the Druids considered Mistletoe that would grow around oak trees to be especially sacred. The most common mistletoe we find today in our homes, yards, and in nature is native to the United States and grows all along the East Coast. 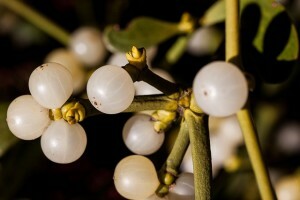 **Mistletoe is considered to be a very poisonous plant and should not be consumed. The distinct tradition for using Mistletoe is to hang it in a doorway so that two lovers can kiss underneath it. It is said that this act will ensure their love will last. Add Mistletoe to love spells to increase their potency. Burn in your hearth fire or in candles for protection, especially for the protection of children. Place or hang mistletoe on the mantle of your fireplace to protect your home and occupants. I love to know what my readers are up to! If you have any suggestions on subjects for future posts, give me the scoop! I’m listening. Don’t forget to subscribe to my mailing list so you don’t miss these amazing posts!